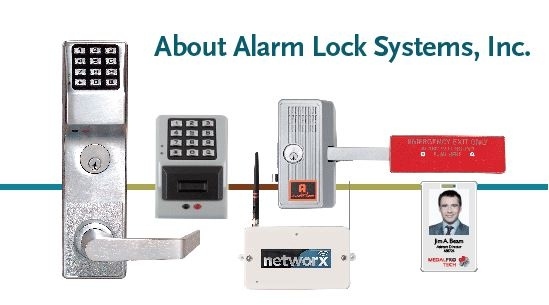 For the last 4 decades Alarm Lock products has built a rock solid reputation as a respected security leader in the design and manufacture of electronic and mechanical access and egress control keyless entry products that can be used on door to provide controlled access to your home or business. Originally known worldwide for its superior Sirenlock panic exit and delayed egress exit alarms in full-door and clapper styles, Alarm Lock has nearly eclipsed its original product success with that of another product line that is the incredibly-popular, innovative Trilogy line of standalone access keyless locks that enables Pre-Lock Security security to provide buildings of all kinds cost-effectively security and allow us to add dependable wireless access control a door at a time with a field-proven access solution and with a consistent model for every door type in your home or business. Trilogy® electronic access control locks, include original standalone and new wireless networking Trilogy Networx access locks, featuring global lockdown in seconds and eliminates the need for door-to-door programming and audit trail queries by communicating wirelessly via ethernet or 802.11. All Trilogys digital locks feature the same rugged dependability, and tool-free keypad programming, with cylindrical models boasting Grade 1 BHMA certification. Models are also available in dual-sided access, mortise, privacy lock and narrow stile, for glass doors, and exit trim models which automate existing mechanical pushbars by time-schedules you set and control. Please take a moment and review some of the Trilogy products we carry and let us show you how we can provide you with the latest in digital access for your home or business. Call us Today at 416 736-8383.